More than 2 inches of snow fell on parts of New York City Friday morning, as a fast-moving winter storm swept through the tri-state amid an arctic blast that has battered the region with icy winds and temperatures in the single digits and teens. Light, fluffy snow began falling in New York City at about 6 a.m., and tapered off within about four hours. Snow totals across the region ranged from about half an inch to 2.5 inches. Central Park saw 1.3 inches, and the Whitestone neighborhood of Queens had the city's highest total with about 2.2. inches of powder. Alternate side parking rules were suspended as the city sent out salt spreaders to smooth icy roads. Commuters trudged through the bit of snow that accumulated on sidewalks, slipping occasionally on patches of ice that formed over the frigid week and were hidden by the white dusting. At subway stations, melted snow turned to mucky water, and normally rapid-moving rush hour swarms underground were slowed as commuters grabbed the railing and walked single file to avoid falling. The fountain in Bryant Park is still spewing out water, despite being overhung by thick icicles amid an arctic blast that has frozen the tri-state area for nearly a week. Skies cleared Friday afternoon and gusty winds of 15 to 25 mph kicked up as warming temperatures flirted with the freezing mark for the first time in nearly a week. Frigid temperatures will return Friday night, with a low of 15 degrees. The high Saturday will again be in the 20s. It will be sunny but bitterly cold. The region will finally begin to thaw Sunday, with temperatures climbing into the mid 30s. This week’s arctic blast caused temperatures to plunge into the single digits Wednesday, in what was the coldest night in nearly a year. 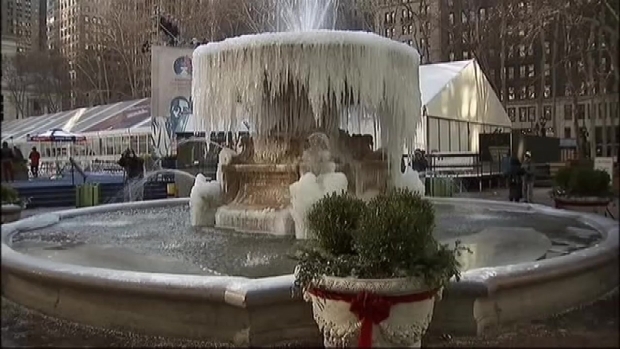 The fountain in Bryant Park was a mountain of thick icicles by early Thursday morning. Despite Friday's slightly warmer temperatures, anyone going outside was urged to wear gloves and hats, along with other protective gear, to prevent hypothermia and frostbite. Mayor de Blasio reminded residents to never use a gas stove to heat homes, and to never use kerosene or propane space heaters, charcoal or gas grills, or generators indoors or near the home. Winter weather will return next week with a mix of rain, sleet and snow possible by Wednesday.